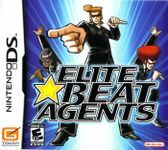 Call the Elite Beat Agents! Save the day by rocking solo, co-op, or head-to-head in the ultimate rhythm-action game! The fate of the world depends on your touch-screen skills as you jam out to 19 songs like "Material Girl," "Sk8er Boi," and "Y.M.C.A."! Tap and slide markers to keep the beat!